Lisa loves John: Tuesday Tea and Academy Award Recap! 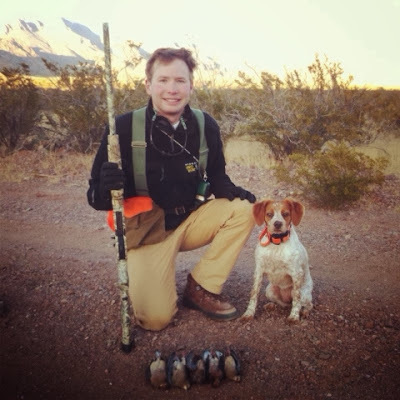 Firstlyyyy, happiest of birthdays to my sweet, sweet husband!! I’m so proud to be your wife, and I love you very dearly! Secondlyyyy, most people did their Academy Award recap yesterday, but I figured better late than never (this girl went to bed right after they were finished!!). I thought Ellen did an awesome job. Did anyone else find it absolutely hysterical when she was handing out pizza and Brad Pitt was following with paper plates?! I’m pretty sure she should host every year! As far as my predictions, the only category I missed was Best Picture… not bad! And the dresses… I swear, everyone looked amazing! Here are some of my favorites from the night. How gorgeous is Kate Hudson?! There really weren't any ensembles that I thought were a total miss. And how about Jennifer Lawrence tripping again this year? I am fairly clumsy myself, so it is nice to have someone to relate to! Lastly, have you seen this hysterical E! Online name generator? My name would be Laes Spdda (basically… this makes no sense, but I love it anyway)! Love JLaw, love Ellen, overall it was so fun to watch!! It was such a great show! I really enjoyed it and thought everyone looked so beautiful! Ellen should now be the permanent host. I bet the actors appreciated her lighthearted hosting vs. the somewhat usual Oscar stuffiness! The pizza part was definitely my favorite. Has John Travolta issued an apology to Idina yet??? So fun, thanks for linking up with us Lisa, loved your post! I thought Ellen was amazing too! I couldn't get over those dresses either - so beautiful! I think Jennifer Lawrence is my soul sister... I trip all the time! Thanks for joining us today - happy Tuesday! 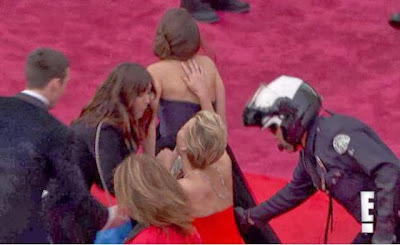 I think its hysterical that JLaw almost took the other girl down with her lol! Ellen is indeed one of my favorite hosts - she always does a great job!! I thought everyone looked amazing and totally agree that Charlize Theron was stunning!! I didn't get to watch :( I had to work Sunday night! Boo. Happy Birthday to your hubby!! I love that John Travolta thing...SO funny! I didn't watch, but I loved all the recaps yesterday and I love checking out all the outfits online!!! I may have been the only person to not watch the Oscars the other night mostly because I don't get to the movies very oftern. I did have a chance to catch up on all the good parts via You Tube! Ellen's opening monologue was pretty hysterical, she did a great job. I'm super bummed I missed it, we ended up having too much fun with friends. I did catch the highlights though. Loved the pizza, I did not notice Brad with the plates though - now that's a gentleman haha! I think Ellen should host everything. Kate and Lupita definitely topped my best dressed list. My friends and I all did the name generator at dinner last night and were cracking up!! I love Idina so I'm happy that at least the snafu has given her some more exposure! Ellen is just the best! And I love Jennifer Lawrence too! I was in love with Jennifer Lawrence and Kate Hudson's looks! Perfection! Happy Birthday to your husbs! Also, love all your picks. My girl crush on J Law is out of control. ah we are so a like on our pics! Don't you just love award season and Ellen KILLED it! She had me laughing so hard (& craving pizza haha) Happy Tuesday! 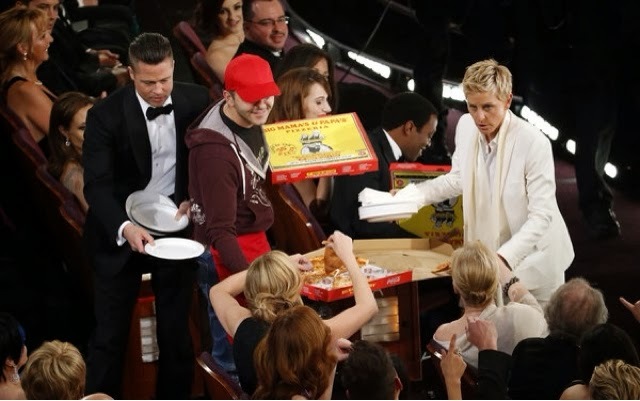 Ellen did such a good job hosting and with the pizza guy. so funny! I think my favorite dress of the night was Jennifer Lawrence- so gorgeous and even if she's a little clumsy it makes her more approachable don't you think? I am not much of an award show watcher, but I watched just for Ellen! I would love if she would host every year! Jennifer Lawrence...that's probably the kind of celebrity I'd be like constantly tripping over my own feet. lol. She does it gracefully, though!